How to Solve iOS 12 Device Is out of Storage Problem? When you want to download that latest photos filter app for yourself but you can’t. That is because of the same old reason; your iOS 12 device is running out of storage! You just don’t have enough memory on your phone to install them. Try not to fuss. Fortunately the fix is pretty basic. Prepare yourself, though, because if you want to have that 1 GB of free space, you will have to get rid of pics, texts and other data as well. iMyFone iPhone Cleaner or iMyFone iPhone Cleaner for Mac is the best software that serves as a professional iOS 12 cleaner. Umate Pro is potent in elimination different types of iPhone files and data and increase the performance of your iDevice. Use iMyFone Umate Pro to solve iOS 12 device is out of storage problems. To utilize iMyFone Umate Pro in solving iOS 12 storage problems requires the following steps. Step 1: Connect your iOS 12 device to your PC and run Umate Pro app from your PC. Step 2: Click on "One-Click to Free Up Space" to run a full space saving analysis. Step 3: Click each "Clean" button to release space for your iOS 12 device. 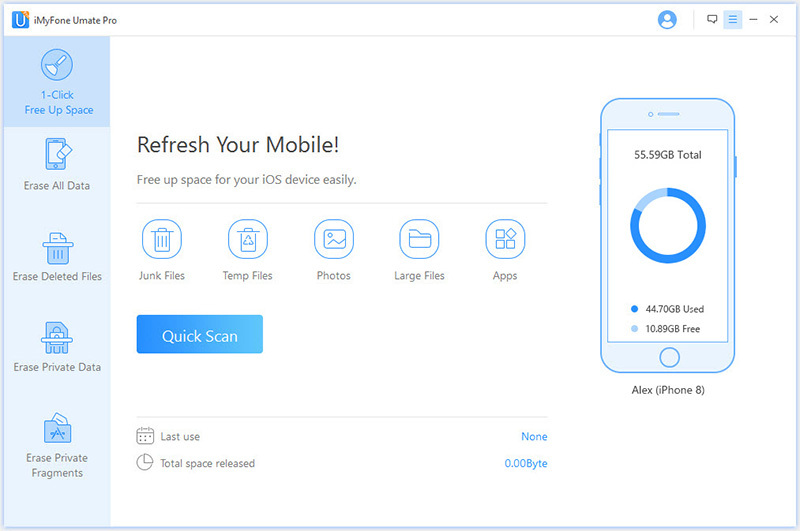 Clear up useless junk and temporary files: iMyFone Umate Pro can clean up 30+ hidden junk files to free up iOS storage space in the shortest possible period. Some of the prominent junk files in iPhones include browser caches, cookies, App logs, call logs, etc. Compress photos: 75% of photo space can be recovered using iMyFone Umate Pro. The photo compression will never ruin your photos; you will hardly be able to differentiate between the compressed photos and the original photos if not based on the file size. And original photos will be backed up on your PC. Preview and bulk delete videos, photos, apps: After scanning your iPhone with iMyFone Umate Pro, all large files in your iDevice will be listed. You can preview through the large videos, audios, photos, apps, etc. and selectively delete them to create storage space. Erase useless deleted files: iMyFone Umate Pro can detect and erase previously deleted files, such files are not completely overwritten and can still be recovered by data recovery software, which not only eat up space but also lead to privacy leak. Erase sensitive private files: Recovering deleted files from iPhone is very possible when using some recovery tools. If peradventure some of your sensitive files are recovered from your iPhone, such files can be used against you. Hence, you need a data destroyer tool like iMyFone Umate to permanently erase your sensitive files beyond recovery. Factory resetting is an efficient way to solve iOS 12 is out of memory problem. Hence, if you notice signs like sluggish access to applications, delays to access live image in camera app, hanging effects during contact scroll, or other delays while using your iOS 12 device, then you should factory reset your device. 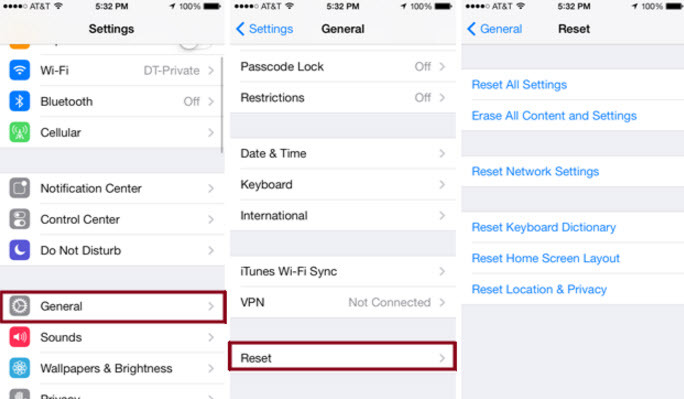 Step 1: Click on "Settings" then "General" and scroll down to "Reset." Step 2: Click on "Erase All Content and Setting". Step 3: Enter your Apple ID and Password. Step 4: The resetting process will take few minutes and will be complete when you see "Swipe to Continue." Once this process has been initiated, every bit of data on your iOS 12 device will be wiping out, and it cannot be stopped in the process. Hence, ensure that you have backed up your files to iCloud or iTunes. iCloud is a way to manage your iOS 12 storage space by connecting your device to a Wi-Fi network and uploading your device content to the clouds. To fix iOS 12 device is out of storage problem, you can upload any type of file, be it apps, music files, videos, contacts, calendar events, notes, etc. and delete the files off your device with the assurance that you can retrieve these files whenever you have a need for them. Step 1: Connect your iOS 12 device to a Wi-Fi network. Step 2: Click on Settings and scroll down to tap on iCloud. Step 3: Scroll down, select Backup, and make sure that iCloud Backup is turned on before proceeding. Step 4: Click on Settings > iCloud > Storage > Manage Storage, then select your device. After these steps, backup screen will appear estimated time for backup and file size. There are many Apps that we maybe used them only once or twice. The problem is that they take a lot of your phone’s memory space, restricting you from taking more photos, downloading more data and etc. To get rid of this problem, simply delete the apps you don’t use often. You can simply tap and hold the app icon, it’ll start to wiggle, tap the “x” on top of the icon, tap on the delete button and that is it. If you’re one of those who love taking a lot pictures, selfies, making videos and what not, and have thousands of photos in your iOS 12 device… well, removing those pictures from your device can save you A LOT of space. You can have a backup of all those pictures on your PC using iTunes very easily. Photos aren’t the only thing that takes a lot of space on your phone, you’ll be surprised to see how much space you can save if you start to delete other data like voicemails, reminders, and contacts and even call history. 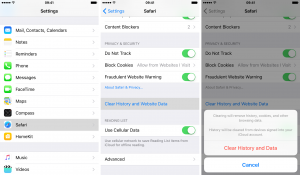 Another speedy, simple approach to tackle the “running out of space on iOS 12” error is to clear annoying cookies and other data from the cache of your phone’s internet browser. The method is quite simple, go to “Settings”, scroll down to “Safari” and select it. Then again, scroll down and tap on “Advanced”, then select “Website Data”. Finally tap on “Remove All Website Data”. Yes, switching off your app notification can’t only save your battery life, but it can save your phone’s memory too. 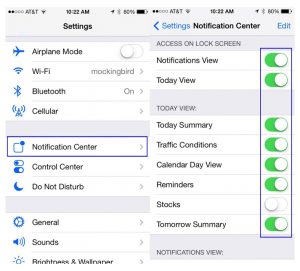 The method is simple: go to “Settings”, select “Notifications”, select and disable the notifications for the apps you want by simply toggling off the “Allow Notification” option. You don't really need to have each song on your iOS 12 device. You can simply sign up for iTunes Match and you will have each song you claim accessible to you by means of the cloud. In this manner you can erase your music from your phone realizing that each track you may wish to listen to is only a download away. Sign in with the Apple ID and password that you use for iTunes Match. In the upper-left corner, tap Settings. 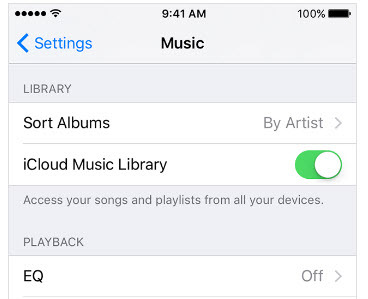 Turn on iCloud Music Library.